I have been working with the Bing search engine for the last couple of days after switching to it from Google Search. It still takes time to get used to this new search engine after using Google for the last decade or so almost exclusively. I really do not want to say to much about the reasons for switching only that Google in my opinion has deteriorated from the perfect search engine to a cluttered monster that often failed to display the results that I wanted to find. That, and that they place scraper sites with my articles in front of my own site. Bing it is now. It is the second most popular search engine in the US with Yahoo Search being third. The first thing that you notice when you use Bing is that they do not automatically focus the search form. That is a bummer if you have been using Google Search for that long. 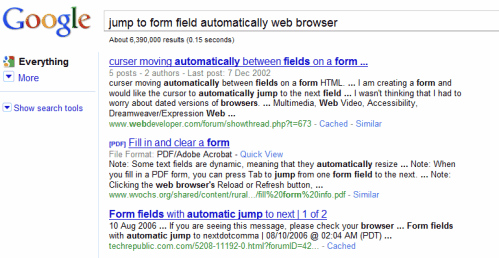 A quick search on Bing for jump to form field automatically web browser revealed my own site as the number one result explaining how to automatically jump to a first text field. The same search on Google did not reveal the information needed on the first three pages and I stopped looking further after that disappointing result. Focus First Textbox is a userscript that will automatically focus the first textbox (that is the search form on Bing) on many websites. The userscript is fully compatible with the Firefox web browser if Greasemonkey is installed. It is likely that it will also work fine in other compatible web browsers such as Google Chrome and Opera. This little helper can save lots of time especially if you use the search engine often throughout the day. Bing offers localized versions of their search to visitors outside the United States. These localized search engines often lack features that Bing for the United States offers. Bing displays the current localization at the top right corner. It may pay off to switch that to United States. If you do not do it you might miss out features like summary text which are described below. Several of the tips in this article require the usage of the United States version of Bing. Bing displays a small excerpt for every search result. These information are usually taken from a site's meta description tag which are often auto generated or not optimal. The summary text feature of Bing displays additional information about each search results. Hover over a search results in Bing. Notice that a small arrow on the right side of the entry appears. The text summary will be displayed if you move the mouse over the arrow. Bing displays search suggestions in the left sidebar and footer. They call these search suggestions related searches. You might know them from Google where they are displayed in the footer usually. 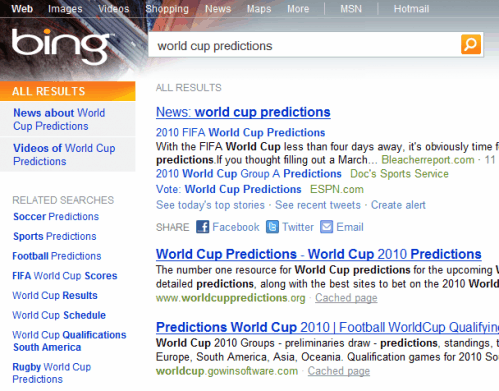 Bing offers RSS feeds for their search results. 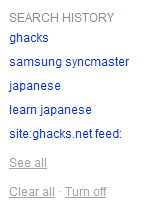 These feeds allow the user to keep track of new search results easily. This can be helpful for webmasters and business owners who want to monitor how their sites or competition fares in the search engine. Google does not offer this but Google Alerts can be used for this purpose. Most modern web browsers can identify RSS on pages automatically. Firefox for instance displays the RSS feed information in the browser's address bar. A click on that icon will load the RSS feed with options to subscribe to it. Bing keeps track of the searches of a user in the search history. The history is displayed on the left side displaying the last searches conducted by the user. The See All link leads to all the searches conducted over the last 28 days which can be helpful to repeat a search done in that time. Search history can be cleared and turned off at any time in the same sidebar. Bing offers additional neat features like video previews on the search result pages. Do you have tips that you would like to share with the rest? Let us know in the comments. 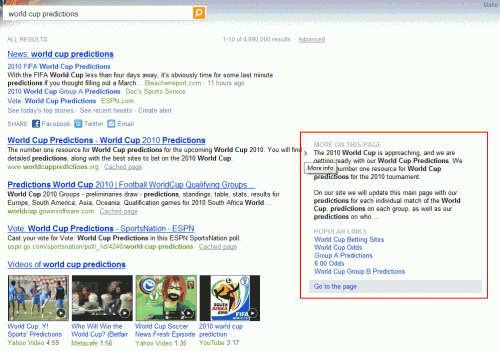 About search quality: Is Bing always displaying better results than Google? Nope, it is not. The current trend however suggests that Bing (and Yahoo as well) have increased their search relevancy and quality while Google's deteriorated. Previous Post: « Happy birthday Bing! Have you used the keyboard shortcut navigation? Once you use it, you can’t live without it. I just hope that Bing notices this and build one in. My only reason for hope of this is Hotmail now has the option of using gmail style keyboard navigation, which means someone in MS does care about and use keyboard navigation a lot. Have not been using keyboard navigation in Google Search, it does sound interesting to speed up a few processes though. Gmail’s j/k, enter, c, g then i, /, and u; Google reader’s j/k, v; are indispensable, just as much as Google’s search’s j/k, and o.
gmail’s enter, reader’s v, and search’s o can be used with shift to open that thread/feed/result in a new tab, and I always use Firefox’s divert to background which sends all the reader’s interesting feed to new tabs for me to digest later tab by tab.